Ulrike Gerbig lives and works in Germany. Her first collection of poetry Every Woman's Blues, was published in 2004 by Lapwing Press (Belfast, Northern Ireland). She has just finished Love in All the Right Places, her second collection of poetry. 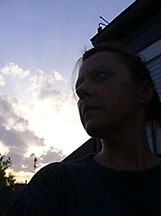 Ulrike's poems have appeared in several e-zines and magazines,including The Poetry Kit Magazine, Photoaspects, Electric Acorn, Unlikely Stories, Zygote in my Coffee, Out of Order, Open Wide, Mouseion, Aesthetica and Voices of Israel: An Anthology.